Antiques challenge. 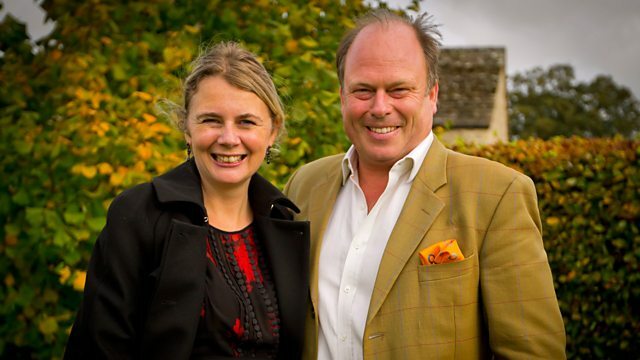 James Braxton and Catherine Southon compete at an auction in Somerset. Catherine gets into deep water trying to sell some waders. Browse content similar to James Braxton v Catherine Southon - Auction. Check below for episodes and series from the same categories and more! diamond Catherine Southon at an antiques auction. Coming up - James feels the pressure. as busy as a bee out there. I can feel this, like, hot flush going on, on me old head! You may be wondering why and I am asking myself the same question. -James, could you fillet this for me? I don't think I can even lift it! Welcome to a historic event in the making. in a clash of the south coast titans. descending to the pits of the sale room. After all, I've got to try and make a profit on this. His rival leaves mere mortals lying in her wake. Buying is easy. Selling is quite another matter. all in the name of making the most profit for their chosen charities. -James! Always a pleasure. How are you? I know, the sun is shining. -But it's a bit chilly, isn't it? -It is a little bit nippy, yes. -Raring to go for the auction? -Raring to go. I've read the catalogue. -That's pretty good, isn't it? -That's very good, you've done your homework. -Well, I don't know. Who knows? We'll see what happens. -And £1,000 to spend, James. You could almost buy the sale for 1,000. And have some left over for tea afterwards. Come on! as the countdown to today's auction is under way. the profit. But it seems Bingo is in his element! There's a good lot of furniture - ceramics, decorative items. so whoever's here is my competition. Or whoever's been at the view day and has left a commission bid. Looking around...I may struggle to spend three figures. I hope that James is having the same problems as I am. He looks like he's enjoying himself a bit too much for my liking. Well, you know Bingo, he's always got a smile on his face! he soon spots something that brings him to his knees - quite literally! Ladybird books. I was brought up on these lovely little Ladybird books. And they're just really nicely laid out books. or natural history. Look, really well illustrated. Just a really lovely book. And you collected them, you spent your pocket money on them. and I think they would be definitely worth a punt. but he's not afraid to crawl on the floor in the hunt for profit! is eyeing up a copper tray. I like the fact that there is a sort of hammered quality to it. On the back of it, it says, "The Birmingham Guild Ltd."
I just think it's got a real appeal to it. And I would say that it looks Arts and Crafts. her rival has spotted another potential profit maker. But he needs to put it to the trademark Bingo Test. it can generally bear the weight of others. Let's give it a once over. and they needed furniture to fill them. It's made of mahogany, with this boxwood stringing round here. It all seems quite sound. I want to buy if for about 40, 50 quid. ..I should be able to sell it for 100-150.
as the sale is about to get under way. starting at the back with Lot 1 in the cabinet. Now, there's no internet at this auction and the saleroom is packed. And it seems that suits Bingo just fine. There's lots of people here. So, you know, there is a world there without the internet. Yes, he obviously likes to look his enemy in the eye. as a collection of silk scarves catches her eye. 21 A, assorted silk scarves. £5 anywhere for it, please? £5? Five seated. Eight standing? Eight. Catherine bids, but she's got competition. Well done, keep going, sir. And again? 12 in the middle at the back. At £12, yeah. 15 it is. At £15. Bingo feels he's missed a trick. You see, it always pays to look at everything. you immediately feel very suspicious and envious. and is bidding on a box of buttons. Winning them for just under £5 with commission. Sewing is the new baking. will soon be a pot of gold. I don't know, but I'm going to have a lot of fun trying. Is she some sort of auction alchemist? and she's got her rival rattled. and I think Catherine's been as busy as a bee up there. Does that make me feel nervous? Yeah, I can feel a slight hot flush going on, on me old head. But there we are, stay calm. and goes straight in on a bid for a collection of seaside postcards. At £10, 12, fresh bidder. At 12 it's going to be, all done at £12. I thought it was going to make 40 or 50 quid. That shows you how little I know about postcards. Bingo is off the starting blocks. as she bids on the copper tray she had her eye on. This is the copper tray. Can I start this one away at £20? At £20. Do I see two anywhere? Bid's with me at 20. 38. At 38, 40, away on my left. No. At 95, in the room here at 95. I put 40 next to it, that's what I was going to spend. 95 it is, then. Are you all done? It's going to sell at £95. It is nice. £95, plus commission. I'll be lucky to make a good profit on that, but I just had to have it. that's more than double what she hoped to pay. for a mixed lot of telephone cards and coins. Which takes a substantial £85.12 from her pocket. So, why did she splash the cash? I've bought a set of hopefully collectable phone cards. It's a really good, comprehensive collection here, from the 1980s. Some of these are very collectable. It's just a matter of trying to find the right people. that amongst these coins is a real treasure. and I'm going to make myself lots of money. Mm! So, Catherine gets a sneaky tip off! but oh, no, she's got her eye on a pair of wooden boxes. All done? It sells at £30. She quickly seals the deal for just over £36 with fees. as a set of three framed tapestries have caught his eye. At 28, it's going to be, then. He quickly sews up the deal for just over £34. This is after Lowry, the famous Salford, the Manchester artist. Coming From The Mill, it's painted after, done in 1930. This one is done considerably later. I rather like it. and I'm very pleased, £28. let's take a look at who's spent what. Our two experts each arrived with £1,000 of their own money. leaving a whopping £951 still to spend. leaving nearly £740 in her kitty. but with wads of cash to spend, he's in prime purchasing position. but he's not the only one who's spotted them. I saw on the floor a big box of these hardback books. I used to have these when I was little. ..I'm going to have a punt. I know Catherine has got this marked. and I see that she's also marked 186. -James is going for it as well. And these I start straight in, I've got £22. At 22. Bidding card at the ready, Bingo bides his time. No, 32. The bid's with me, then. 35. 38. And when Catherine thinks she's home and dry, he swoops in! and the books cost him just under £55 with fees. I think I've paid the money for those. Are you all done? It's going to sell then at £30. ..and wins them for just over £36 with fees. These are my impulse buy. I bought these literally on a whim at the time. This is the best picnic set. I would say it's probably 1970s. I have got someone in mind for this. This is retro, this is funky, this is now. Well, if you're happy then we're happy! A good under-the-table auction lot here. I've got three sherry barrels here. All, sort of '60s, '70s, really out of fashion. could've been a water filter, or maybe a bigger barrel. These jars, very often used for cider or other liquors. and we've got a Bristol maker here. This will make a fabulous, rather splendid lamp. Get rid of those, left with the three, big profits. Up you get, old man! So, with that he has four buys to Catherine's six. and secures it for just £2. But what did she buy? You may be wondering why, and I am asking myself the same question. which I don't think have probably ever been used. And we've got some other safety equipment. £2, I paid for this. I'm going to sail away to sweet success. Well, the life jacket is certainly making her feel buoyant! and, with that, Catherine calls it a day. but I don't want to lose any and this is one of them. Nice little trunk and I've got £15 on it here. At 15. Do I see 18 now? 18 and I've got 20 at the very back. Hurry up. Get your card up quickly. get your number up. That sort of focuses her. Ah, a bit of inside knowledge from the squire of the saleroom! the trunk cost Bingo just over £34. a pair of framed maps, as well. Bid's in the middle at £15. -Come on, get your number on! Do I know any Greeks? they really get his pulse racing. and it confirms that this one of North Devon is rubbish. But this one of Greece is better than expected. I thought "Goodness, that's a good weight,"
so it's a sort of plastic thing, carrying the name of the retailer. And that is old - Charles II. I'm really pleased with this. I think I can add a nought to this. Catherine, you'd better watch out! Bingo's last-minute spending spree is coming up trumps! It's going to sell then at 55.
out of his pocket. So that's it. but how do the figures stack up? but ended up with seven lots at a total cost of £256.58. So what do they make of each other's efforts? Catherine, how did you find it? Interesting, different. But I'm very happy. What about you? -Did you spend a lot of money? -I didn't spend a huge amount, no. Now, your first purchase, I noticed, was the scarves. Well, I went for these purely because of the name. I saw in the catalogue that there was a name that jumped out at me. -which isn't an ordinary bag, James. -Isn't it? What sort of bag is it? -It looks nylon from here. So we have designer scarves in a designer bag. -Designer price, I feel coming on. -That sounds very good. Well done, you. And from the sublime to the ridiculous. What is with the life jackets? Oh, James, I don't know. I went and bought them for £2.00. -But they have got waders. You must know something about fishing and wading. -Have they got studs on the bottom? -It was impulsive but I am happy. That is, to me, is my childhood in a box. -All those books, Ladybird books. -I saw you bidding on that. I think you might struggle to make a big profit on them. -Anyway, I think my top item is my map. -Yes. I'm a bit jealous here. -I wish I had seen those maps. The one of Greece is fabulous. -That's a couple of hundred pounds, I think. So our twosome leave the saleroom behind and head home. of finding buyers for all that auction booty. so they need to pull out all the stops to make the very best sales. Well, it was a funny day at the auction. On initial inspection, there didn't seem to be a lot there. It was a general sale. the more I quite liked it. Barrels. People like these big, decorative barrels. What would they suit? Maybe, possibly a pub. Ladybird books. I've got a lot of books here but I am still unsure who to sell it to. Postcards. Who will I sell that to? than Brighton's oldest fish restaurant? and it will look so much better. And then the map. in the hands of the end buyer, ie, a private collector. Bingo also needs to sell his Edwardian chair and leather trunk. Catherine's enthusiasm for her purchases appears to have subsided. I can't say that I'm overjoyed, because it is a bit of a mishmash. My first disappointment is these phonecards. over the past 20 years is phonecards. I don't know who I'm going to sell these to. That's going to be struggle number one. there is something which is rather special. But I have yet to find it. really make something upcycle items. of the whole collection is the Arts and Crafts tray. I think it might be difficult to try and get a big profit on it. but I think it is probably one of the better items that I bought. new, retail, you're looking at about £25-£30, apparently. So I think they will definitely give a profit. Nevertheless, there is some success here. I've just got to find it. and haggle hard for top prices. and has headed north of London in search of her first buyer. and he is a little bit sceptical. is the one phonecard that he hasn't got in his collection! along with a box of coins for just over £85. Oh, wow - this, this is the collection already. -I've got a few out to show you, yes. -Is this the entire collection? -No, I have got about 80,000 cards, mostly up in the loft. all of yours aren't sort of advertising ones. -A lot of these are advertising. The earlier cards mainly don't have logos. From the very early '80s. Most of the normal cards were fairly widely available. It is getting the sort of older, rarer cards. I'm still hoping to find one of those in the collection. I will say, though, that I'm quite excited by that card. I knew you would be. You haven't got that one, have you? I am quite excited by that card. That is one of the rarer cards. -I knew you would be. -There are obviously quite a lot there. -Certainly, maybe we can do a deal. -What sort of figure are we talking? -Tell you what - 30 would be lovely. Can you do 30? Will you do 30? That is wonderful. her profit is up in the air. he's going to do a grand tour of the south coast! But he's hoping to kill two birds with one stone. I've come to a local framer to see David. I'm hoping he can transform my Lowry tapestry panel. if it looks really good, they might even buy it. James paid £34 for the Lowry, along with the two other tapestries. Hello, David. You're keeping a very tidy place. Well, we like to keep neat. -Now, David, this is the thing I spoke about on the phone. I think it's been killed by the frame. I was sort of thinking that I might go for a black frame. Black would certainly fit that bill. -David, how much will it cost for that mount and frame? -Get on with it, David, then. and convince David to purchase his picture? -David, oh! Surprised! I am ready. Surely. That is superb, isn't it? Look at that! That is transformed, isn't it? I think it's a great improvement. Really sets it off well. -Is it something you would buy, David? -We may well consider it. would you be grabbing my hand? I think I would like that on my wall for £100. David, you've got yourself a deal! taking £85 overall and netting a profit of £50.95 on the lot. Next up, Catherine heads to South London for her second sale. Inma, hi. Catherine. Lovely to meet you! -This is a super place you've got here. I don't know, I feel very creative as soon as I walk in! -I have brought here a tin of buttons. So is this something that you'd be interested in purchasing? and it has got really nice buttons inside. I think we would be interested. -There are some nice buttons. What sort of value are we talking? -I think it will range between £12-£14. -I mean, 15 would be lovely. -Is that too much for you? -14? I'm happy with that. So that's £9.14 profit, and our expert's triumphant. I don't think you were too impressed with those buttons, James. But I have almost tripled my money. Who's laughing now, Bingo? Mm! Fighting talk from canny Catherine! ..banking a tidy profit of £18.52. but Bingo's never far behind. And he's back on the coast in search of his next buyer. I'm just outside Brighton with my little clutch of postcards. One of which is rather special. It is of the fish market in Brighton. would no doubt have been here. he needs to dress for business. -Hello, Michael. How are you? What are you tucking into there? for an order that has got to go out later on today. Now, here is the little collection of postcards. -This is the one. Isn't that amazing? -So that was the West Pier, wasn't it? put a stamp on and use them. They have absolutely no value. -They're very generic. What would be a fair price? £35? -No, I would like £35. -Say we meet in the middle at £30, then. £30. I am very happy with that. So that's a very tasty profit of £15.41. But Bingo doesn't get off that lightly. James, you couldn't give me a hand with this order? -Of course I can, Michael. Make the most of me. -Can you start scaling and gutting the sea bass for me? -I'll have a go. I am a fisherman, you know. Right, James, you seem to have coped quite well there. -I will go and get you a bit more to get on with. but there's something else in the water. James, could you just fillet this for me? Blimey! I don't think I could even lift it! Maybe it's time to head back to the world of antiques, eh, Bingo! Catherine has been hard at work. to meet specialist dealer Pete with her box of coins. Are there any gems in there, first, because I... One gem? and it's aluminium but it's in quite good condition. -And my offer, just on that one, would be £15. -Oh, really? Is that all? -So what is the offer for everything? Oh, dear - not a great outcome there. Catherine's made a loss of £7.12 on the entire lot. plan of attack, let's take a look at the scores so far. and his profits stand at £109.48. she's only made a profit of £39.06. but it's Catherine who wades into the next sale. ex-employee and keen fisherman Peter in Nuthurst in West Sussex. so has to make over £2.43 on the waders to make a profit. You haven't got any wellies on. Where are your fisherman's wellies? -And for that I have brought you these. What do you think? -What are you after? £25? Go on, then. £20. And I expect you to catch something. -You put them on and test that there are no leaks. I think...no, come on, I think £25, if I go in there. That's fair - come on, Peter. If they've got a hole in, I'm going to cry. the boots just need to pass the test. -Pete, I've got some bad news. I think this one's got a hole in it. Put a bit of rubber along, like a puncture repair kit. -Dip your foot in and see if you feel water coming in. -Can you feel any water coming in? I think a little bit seeped in. -Well, as I did go in - go on, then, 15. £15 for a pair of leaky boots?! Maybe Peter took pity on her. Either way, she makes a £12.57 profit. Just goes to show - you should try before you buy. But I made a profit - that's pretty good for me! this time heading to Weymouth with his mixed lot of barrels. and manages to sell one of them to landlord Kevin. -I'll give you £35 for that one. You've gone and got yourself a deal. I'll take the other ones away, Kevin. as he heads further west with his map of Greece. and I hope this map may navigate me to profit! -I see the master at work. Well, not master, but working. which I'm sure you know considerably more about than I do. Ah, yes - well, we lived a long time in Greece, as you probably know. because it's actually moderately inaccurate. and I'm sure this will have an enormous amount of inaccuracies. I'm very happy to take a fair offer. What is your offer for it? Well, I'll try an offer on you. I'll try £55. I am very happy for you to have it at £55. Good - well, that pleases me very much. of £51.76 on the pair. the copper tray that cost her a whopping £115. will take a shine to it. -Hello, John, lovely to see you! I've brought you an Arts and Crafts tray. -It's Birmingham Guild, it's stamped on the back. I'm guessing this is late 19th, early 20th century. And this is all handmade, isn't it? as you know, it's all about being handmade. But, yeah, no, that's straight-up Arts and Crafts, Birmingham Guild. Before we get to the crunch, I did purchase this at auction. -And I did have to battle a little bit to get it. Well, I'm thinking in the region of around...150, 160. I was hoping for a bit more, John. Would 200 be too much? more than doubling her total so far. making him a modest profit of £5.95. he ends his grand tour of the south coast back on home turf. who runs a nursery school. What better place to sell these books than a place that has story time? so let's hope there's a happy ending! Nick, what valuable tome are you reading there? -I'm reading all about Sir Walter Raleigh. -My vast array of Ladybird books. The lovely thing about Ladybird books is they were very well illustrated. -I liked them and reading...key to learning, is it? It is the key learning, isn't it? For everybody. And at this age, they are really interested in books. Nutty business - price. Now, how do you value learning? -I want to try and get about 55p a book. I tell you want, 55, and you've got yourself a deal. Why don't we split it in the middle, then? 50.
and I hope you put them to good use. But, as Bingo said, you can't put a price on learning. Hello - I've got the most fabulous story for you! I've got Piggly Wiggly Plays Truant. And I know children love hearing about naughty children, don't they? "after Mother Pig had called him, for he always snored before. "Piggly washed and gobbled breakfast, packed his school books in a rush. "Hurried round in getting ready, never gave his clothes a brush." I think you've found yourself a new fan base there, Bingo! with today's Put Your Money crown. But first, let's remind ourselves of what they spent at auction. But of course, it all comes down to profit. who is today's Put Your Money Where Your Mouth Is champion! -Hi, James. How are you? -Hi, Catherine, how are you? Good to see you. You well? I couldn't find anything I really, really wanted to buy. I bought one thing that I loved, which was that copper tray. That wasn't bad. Everything else was patchy. and I transformed it with a new frame. The map! The map - I was jealous of the map. Yeah, the map did all right. Oh, James! Well done! You did really well in the end. -I think that sounds good. with over £70 in it. but in the end, I had it and, you know...winning is the key. Well, there we have it. Well done, James. Not too bad a difference there, but you just pipped me to the post. when our duo go into battle at an antiques fair in Sussex. Everywhere I go, there's opportunity after opportunity. James Braxton goes head to head with Catherine Southon at an auction in Somerset. James decides to do a selling tour of the south coast, while Catherine gets into deep water trying to sell some waders.